June 2, 2012 Field trip to Mt Magazine, led by Lori Spencer (author of Arkansas Butterflies and Moths), Eric Sundell, and Sid Vogelpohl. Participants should gather at the Mt. Magazine state park Visitors’ Center at 10 a.m. for a two hour morning walk. Bring a sack lunch or dine at the lodge. After lunch, Eric and Sid will lead a second trip to the intriguing, Arkansas-endemic Maple-Leaf Oaks near Brown Springs. Folks leaving the mountain via Paris are welcome to make a stop at the Vogelpohls’ place and score yet a third field trip, thus completing a rare one-day botanical hat trick. 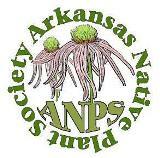 This entry was posted in Field Trips and tagged Arkansas Native Plant Society, Brown Springs, Lori Spencer, Mt Magazine, Vogelpohl's property. Bookmark the permalink.